Corporate governance is one of the essential elements of any corporation development as it plays roles to design and promote principles of fairness, accountability and transparency. Western concept of corporate governance either the Anglo-American model that promotes shareholder-value system or the European Model that upholds the stakeholder-value system has been subject of continuing debate for well over a century. By contrast, it is observed that there is not much discussion or literature on the issue of corporate governance from the Islamic perspective. Due to the lack of literatures, Iqbal and Mirakhor attempts to formulate Islamic corporate governance which is based on stakeholder-oriented model. Their main arguments are founded on two fundamental concepts of Islamic law i.e. property rights and principles of contract. This deconstruction paper is intended to provide brief analysis and commentaries on the issue of corporate governance in Islamic economic system. Corporate governance in banking has been analyzed very extensively in the context of conventional banking markets. By contrast, little is written on corporate governance from Islamic perspective particularly the governance structures of Islamic finance sector, despite its rapid growth since the mid 1970s and their increasing presence on world financial markets (Hamid, Y. (2007: 308). Only in 1990s there are few international infrastructure institutions established with purpose to support the Islamic financial sector particularly on the issue of corporate governance and these include the Accounting and Auditing Organization for Islamic Financial Institution (AAOIFI) and the Islamic Financial Services Board (IFSB). The AAOIFI has issued 56 standards and 4 of them are specifically related with the shari’ah corporate governance namely the standard on Shari’ah Supervisory Board: Appointment, Composition and Report, Shari’ah Review, Internal Shari’ah Review and Audit and Governance Committee for Islamic Financial Institutions (Iqbal. M, 2007: 373). The IFSB has issued a few prudential standards on Capital Adequacy, Governance of Investment Funds, and Corporate Governance in Takaful Operations, Shari’ah Governance and Market Conduct. There are few standards which specifically providing guidelines on corporate governance namely the Guiding Principles of Risk Management for Institutions (other than Insurance Institutions) offering only Islamic Financial Services (GPCG) issued in December 2005 and the Guiding Principles On Corporate Governance For Institutions Offering Only Islamic Financial Services (Excluding Islamic Insurance (Takaful) Institutions And Islamic Mutual Funds) issued in December 2006 (IFSB, 2008). In the context of theoretical framework of Islamic corporate governance, there are a few studies have been carried out particularly Islamic financial institutions to come up with alternative models of corporate governance. Iqbal, Z, and Mirakhor, A, in their paper seem to suggest that the Stakeholder-oriented model of corporate governance finds its strong roots in Islamic economic system. 2.1	As pointed out by the author, there are significant problem with the Anglo-Saxon model of corporate governance commonly referred as agency problems. In fact, the business ethicists have considered the shareholder model to be unethical and unacceptable because it neglects the right of non-shareholders and other stakeholders. 2.2	The neo-institutional economists formulate a stakeholder theory of corporate governance and argue that the corporation’s claimants go beyond shareholders and to include others with whom it has any explicit and implicit contractual interaction. The Stakeholder theory rejects the three main propositions of the Shareholder model namely all stakeholders have a right to participate in corporate decisions that affect them, manager’s fiduciary duty to protect the interest of all stakeholder and the corporation’s objective to promote the interest of stakeholder and not only shareholders. 2.3	A critical review of the literatures on the concept of Stakeholder model suggests that there are a lot discrepancy of arguments, contradictory evidence and lack of formal analysis. For instance, the stakeholder theory is unable to resolve the issue of the determination of who really qualifies as an actual stakeholder and whether all the stakeholders should be given rights to influence management decision-making? The authors argue that the stakeholder model have not been able to convince on theoretical, moral or legal grounds that the stakeholders should play an active role in management and control of firm. 2.4	By contrast, the authors view that the stakeholder-oriented theory of corporate governance is strongly recognized in Islam via two fundamental concepts pertaining to property rights and principles of contracts. A major part of discussion attempts to clarify the concept of property rights in Islam and the rest on the principles of contracts as well as corporate governance structure. The authors conclude the paper by emphasizing that the corporation’s objective should be to maximize the welfare of all stakeholders. They further argue that Islam provides strong theoretical foundation to acknowledge the rights and interest of all stakeholders via the principles of property rights and contracts. The governance of any corporation in Islam is ruled by Shari’ah where all the stakeholders including the shareholders, the management, other stakeholders such as the employees, the suppliers, the depositors and the community. The Shari’ah board plays a role to advise and supervise the operation of the corporation so as to ensure that it complies with the Shari’ah principles. The board of directors acting on behalf of the shareholders has duty to monitor and oversee overall business activities and the managers have fiduciary duty to manage the firm as a trust for all the stakeholders and not for the shareholders alone. The other stakeholders such as employees, depositors, customers have duty to perform all of their contractual obligations. In addition, the state as a stakeholder will be the external institution to provide regulatory framework and its enforcement. The definition of stakeholders does not necessary refer to the shareholders per se or to those who have active participation in the decision making process but it includes non-investor or non-owner stakeholders i.e. any party who has direct or indirect participation in the corporation. 3.1	It is worth to mention that there are other papers on the issue of corporate governance model in Islamic economic system. Chapra, M.U. and Ahmed, H, (2002: 13-20) in their research on corporate governance of Islamic financial institution emphasize on the notion of equitably protecting the rights of all stakeholders irrespective of whether they hold equity or not. In addition, Nienhaus, V., (2003: 290) states that Islamic corporate governance should be based on value oriented and promote the principle of fairness and justice with respect to all stakeholders . Archer, S. and Rifaat, A.A.K. (2007) impliedly view that the corporate governance of Islamic financial institution is inclined toward the stakeholders value based model. This is because the nature of corporation particularly of the directors and the management owe fiduciary duties of care and loyalty to the shareholders and also other stakeholders including especially the investment account holders. Grais, W and Pellegrini, M., (2006) view that corporate governance of Islamic financial sector concerns with the issue of protecting the stakeholders’ financial interests via internal and external arrangements. Wajdi, A.D. (2008: 391-413) further supports the notion of stakeholder oriented model in Islamic financial sector where he provides the pyramid of maslahah as a devise or mechanism to protect rights and interests of various stakeholders. Choudury, M,A. and Hoque, M. Z, (2004) on the other hand provide an epistemological aspect of corporate governance by formulating corporate governance approach based on the principle of consultation where all stakeholders share the same goal of Tawhid or the oneness of Allah. Unlike the five papers, Iqbal, Z and Mirakhor, A, attempt to provide theoretical foundations of the Islamic corporate governance through two fundamental Islamic principles of property rights and contracts. 3.2	Generally, the overall presentation of the paper is theoretical in nature. The paper clearly provides the Islamic concept of corporate governance which is founded on the principles of property rights and contracts. The authors argue that the Stakeholder theory of corporate governance is strongly recognized in Islam and therefore acknowledging the rights and interest of all stakeholders to participate in corporate decisions. 3.3	In term of literature review on the conventional literatures on the stakeholder model of corporate governance, the authors rely on a very few studies which are too brief and lack of empirical evidence. The paper does not provide basic features and characteristics of the Stakeholder model that may useful to differentiate with the Islamic concept of corporate governance in the rest of the paper. 3.4	In the aspect of jurisprudential analysis, the authors justify their arguments by providing evidence mainly from primary sources of al-Quran and al-Sunnah and the legal maxim. There seems to be lack of discussion on certain issue such as the elaboration on the Islamic conception of justice or al-adl wa al-ihsan. In addition, the authors do not provide any legal evidence on their definition of corporation. It is contended that that there is less discussion by Muslim scholars on a concept akin to the corporation . In fact, Kuran, T., (2005) writes that the corporation was absent from the Middle East until the nineteenth century . The authors may explain the concept of corporation to develop the notion of acknowledging the rights and interest of all stakeholders in the firm. 3.5	Chapra, M.U in his critical review on the paper commented that while the paper is positively supported the stakeholder model and acknowledge the stakeholders rights, it does not show how to ensure that these rights are protected. The authors’ argument that the observance of rules of behavior guarantees internalization of stakeholder rights seems difficult to be materialized. Chapra, M.U. argues that Islamic norms had become internalized in the Muslim society in classical period of Islamic society and it does not work in today’s society. There are few factors that contributed to the phenomenon of internalization of the stakeholders’ rights and they include common practice of Islamic values, nature of communities, economic environment, absence of agency problems, extensive legal instrument for trade and independence of judiciary (Chapra, M. Umer, 2007: 329-330). In this aspect, he views that there are other factors need for the internalization of stakeholder rights such as well- functioning competitive markets and proper legal framework for the protection of stakeholders. 3.6	Another debatable argument refers to the authors’ view that the task of designing of a corporate governance system is solely the prerogative of the Islamic government. It is the duty of Islamic government to regulate the rules and legislation to specify the appropriate corporate governance structure. This argument raises a few issues such as question on what is Islamic government and how to design the corporate governance structure of Islamic corporation in the countries where the Muslims are minorities. This point needs to be revisited or supported with other cogent arguments. 3.7	The authors view that the institutional arrangement as part of the governance structure is very important in order to provide protection to all stakeholders and to mediate where disputes arise. Interestingly, the paper considers a Shari’ah board as a unique institutional arrangement in Islamic corporate governance whereby it plays a role to oversea and supervises the Shari’ah aspects of Islamic corporation’s activities. The authors further express their views that the idea of Shari’ah board could be extended to a system level board consisting of scholars from various disciplines of economics, finance, shari’ah, management and commercial law. The paper however does not discuss other essential institutional arrangements in Islamic corporation such as the shareholders and the depositors in the case of Islamic financial institutions, the management and the board of directors. 3.8	The overall arguments of the paper provide theoretical foundation of the Stakeholder model of corporate governance in Islamic economic system where the firm’s objective is to maximize the welfare of all stakeholders. It is observed however in a few researches, the main objective of the corporation including the so called Islamic corporation is to maximize the shareholder’s value of wealth. This implies that in actual practice, many Islamic corporations adopt the Shareholder model of corporate governance rather than the Stakeholder model . Therefore, the issue before researchers and scholars is to come up not only with theoretical foundations of Islamic corporate governance but to support it with empirical evidence and appropriate case studies as to the actual corporate governance practice and possible transformation. The model of corporate governance system in Western perspective either the Shareholder or the Stakeholder models raises an issue of the design of an efficient corporate governance structure in Islamic economic system. Iqbal, Z, and Mirakhor, A, come up with an approach that the Islamic corporate governance inclines toward the stakeholder-oriented model where its governance style aims at protecting the rights and interest of all stakeholders as a whole. They provide theoretical foundations of the Islamic corporate governance through two fundamental principles of property rights and contracts. While the paper presents convincing arguments on the stakeholders’ model of governance from Islamic perspective, there are several debatable points that need to be further explored and discussed. A critical review of the paper seems to suggest that there is a need for further research on the issue of corporate governance in Islamic economic system from theoretical and empirical perspectives. 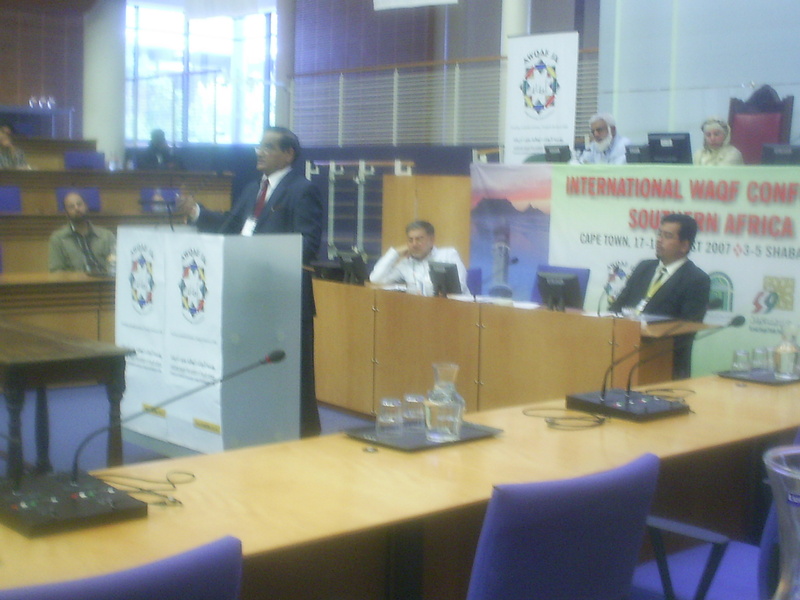 International Awqaf Conference, South Africa.